Pure velvet on the tongue, followed by the most wonderfully sweet crunch imaginable. The original Popcornopolis® gourmet flavor—the one that started it all—is still made using only the finest all-natural ingredients: pure cane sugar, real creamery butter, and a mix of secret spices, so every bite is even more delicious than the last. 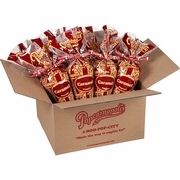 What better way to show your appreciation to clients, associates, friends or family than a gift of our sumptuous Caramel Corn? The case contains 12 beautifully packaged, guaranteed-fresh Popcornopolis signature cones, each ready for giving. Just be sure to include yourself on the gift list!